When it comes to things in this world that make us smile, baby turtles rank quite high on the list, so the news that Peru is releasing 500,000 yellow-spotted Amazon River turtle tots into the wild is really something to celebrate. The National Service of Protected Natural Areas by the State (SERNANP), a government-run conservation group, has been setting the babies free in batches, with the first waddling into the wild in October and more to be freed in mid-November. The Amazon River turtle is a threatened species, and wildlife conservationists hope this massive baby turtle reintroduction project will give the turtles a stronger chance at survival in the long run. 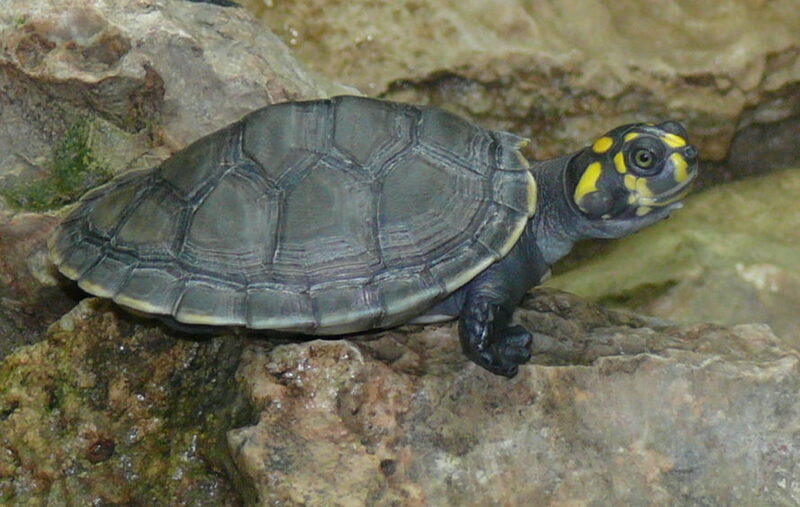 When full-grown, the yellow-spotted Amazon River turtle (P. unifilis) is one of the largest turtles in South America, and locals call them Taricaya turtles. They can measure up to 18 inches long and weigh as much as 17 lbs and, in ideal conditions, live up to 70 years. Protected under the Convention on International Trade in Endangered Species (CITES) appendix as well as the US Endangered Species Act, populations of the yellow-spotted Amazon River turtle have been in decline for years. Conservationists hope this massive release will change all that. The baby turtles were conceived in the wild and, in order to give them a better chance at survival, volunteers and employees from SERNANP collected the eggs in August. They were then incubated in man-made habitats for 70 days, the same amount of time they would remain in their underground nests in the wild. Turtle eggs are a target for hungry predators desperate for an easy meal, so nests are often raided leaving few, if any, eggs to reach maturity. So far, around 17,000 turtles have been released. Two more phases will bring the grand total to around 500,000 baby turtles, who will live out the rest of their natural lives in the wild and hopefully reproduce successfully, securing a stronger future for the at-risk species. Peru is releasing around 500,000 baby yellow-spotted Amazon River turtles into the wild in an attempt to save the species from extinction.